There are many examples to be found online of how to build this type of aerial along with some useful Slim Jim calculators which can be used to determine the basic dimensions. 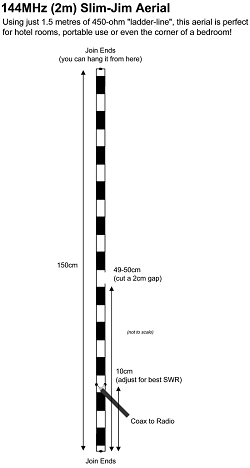 Scaling them for other bands is quite straightforward – In this example, I’m making it for the 144-146MHz (UK allocation) 2m band but you will find that it works reasonably well on 70cm, as well. The most common way to make this aerial is to use an off-cut (155cm) of 300-ohm slotted feeder or 450-ohm ladder-line. Other (and more robust) versions can be built using aluminium or brass rod – perhaps as an outdoor solution. Once you have joined the ends, the overall length is around 150cm. 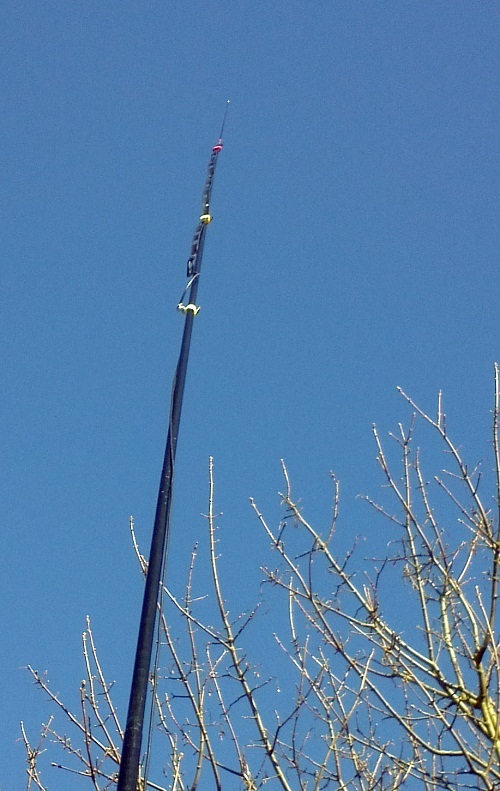 When building it from balanced-line, it becomes a lightweight and easily deployed aerial that can be rolled-up when not in use – even taken on holiday and hung from a curtain pole in your hotel room. Personally, I think that using 450-ohm ladder-line offers the best performance and ease of tuning. I’ve seen a couple made from 300-ohm feeder that didn’t match well, so I would advise using the 450-ohm stuff. The position of the feed-point (around 10cm from the bottom) needs to be set for best SWR – I had to move mine down by around 15mm (to 98mm from bottom) in order to get a perfect match around 145.200MHz. Using the dimensions given on the right, mine was resonant around 150MHz. A quick re-solder and a test with the MFJ antenna analyzer soon brought things under control. You may find that the best position for the feed-point is actually on the covered part of the ladder-line (which mine was) rather than the “gap” part. 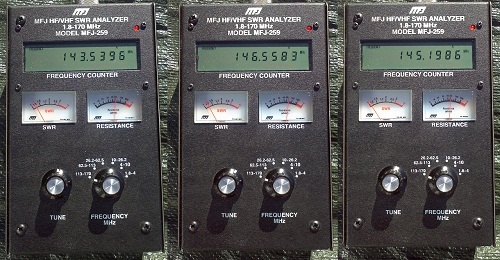 Below: Placed at 15ft up my telescopic fishing-pole with 15ft of RG58 coax, these are my MFJ readings showing over 3MHz of 1.2:1 SWR swing plus the “sweet-spot” of around 145.2MHz. 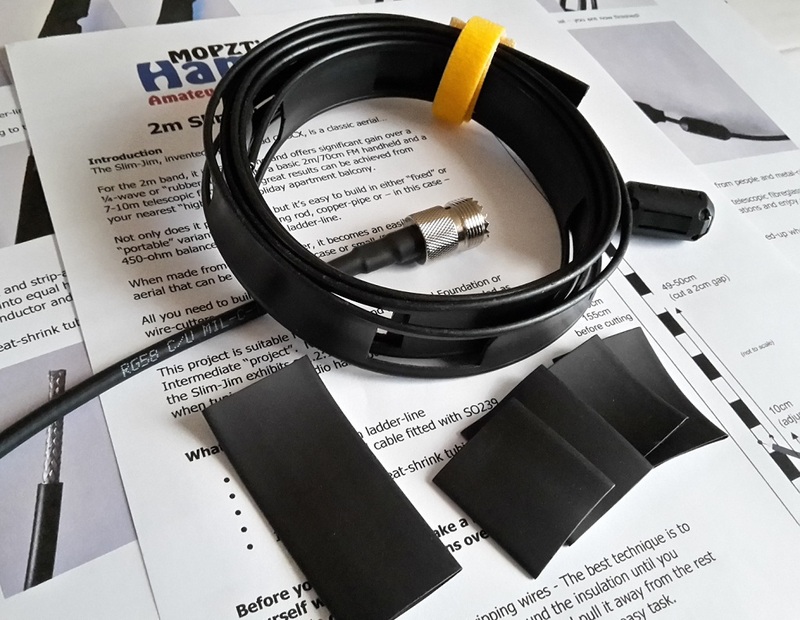 If you are only able to use your radio’s built-in SWR meter, you’ll be pleased to know that the Slim-Jim is quite a wide-band aerial so doesn’t have to be tuned perfectly, but aim for around 145.200 ish which will ensure you get good results in the FM section of the 2m band. 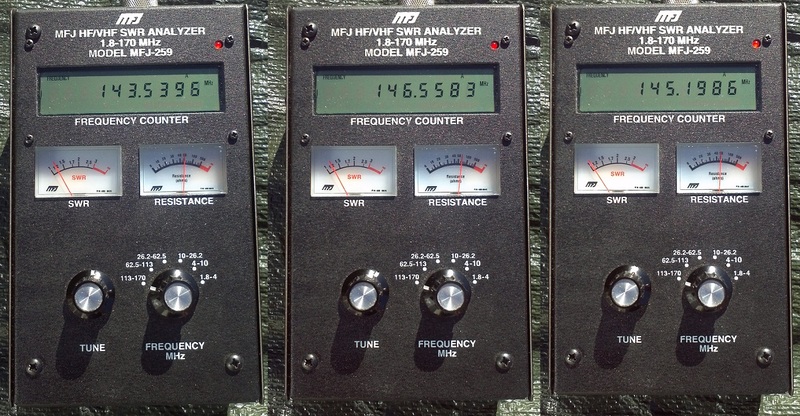 Anything under 1.5:1 will be acceptable – you’ll easily achieve this across the whole 2MHz allocation. It seems to present a reasonable match on 70cm, too. The Slim-Jim was the brainchild of Fred Judd G2BCX who named it due to the J Integrated Matching and the fact that it’s, ahem, Slim. Us Hams do like to give interesting names to our contraptions. The Slim Jim is vertically polarized, omni-directional and offers increased performance over the humble 1/4-wave with a take-off angle of around 10 degrees. The Slim-Jim makes a great temporary aerial for use in a hotel room, perhaps hanging from a curtail rail. 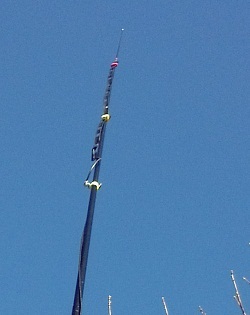 It also works great as a /P aerial when placed up a non-conductive pole (like a telescopic fishing pole). The Slim-Jim is velcro-tied to the pole at around 2/3 up and used with my FT-60 handheld for local QSOs on 2m/70cm. Keep it away from metal objects – the tuning will go a bit wonky if there’s any substantial metal nearby. Also, it won’t like you holding it – so try to mount it somewhere sensible when tuning/using it. You may wish to add a snap-on ferrite at the base of the aerial to act as an RF choke. You can purchase a kit of parts from my Ham Goodies shop for just £10 – it includes everything needed plus detailed instructions and is ideal for Foundation/Intermediate licence-holders who wish to make something “fun”. There is also a price-break for multiple purchases – perhaps a club project?